In a few days time the European Parliament is expected to vote to accept proposals for reform of the EU’s Common Agricultural Policy (CAP), which accounts for a staggering 40% of the EU’s entire annual budget. Amongst the many problems with the CAP is that for many years it has been, in effect, subsidising environmentally harmful activities such as intensive farming, chemical pollution and the draining of wetlands. By taxing food imports to the EU and subsidising EU agricultural exports the CAP has also made it harder for developing countries to compete in their own internal as well as external markets, thereby exacerbating inequalities in global food markets. And because the bulk of its subsidies have ended up in the pockets of large agri-businesses and landowners with inherited estates, the CAP has consistently failed poor, small scale and organic farmers within the EU. In the UK, the single biggest beneficiary of the CAP’s largesse, having received hundreds of millions of pounds of taxpayers’ money in subsidies, is the giant multinational sugar company Tate & Lyle. When discussions over reform of the CAP first began, one of the aims of reform was to shift rewards away from intensive farming to more sustainable practices. It is now clear that pressure from wealthy vested interests has significantly watered down the original proposals, weakening sanctions for failure to comply with environmental good practice, failing to fully protect environmentally rich grasslands, wetlands and carbon rich soils, failing to incentivise good soil management practices such as crop rotation and failing to make agricultural subsidies conditional upon compliance with basic EU law on pesticide use and water pollution. A significant opportunity has been missed. The new Common Agricultural Policy will continue to subsidise the very rich at the expense of the poor, and it will continue to incentivise activities that harm the environment and disadvantage developing countries. Let’s move on to a recipe. This one involves pears from my back garden. We grow two varieties – Conference, and another variety which produces round, almost apple-shaped fruit. 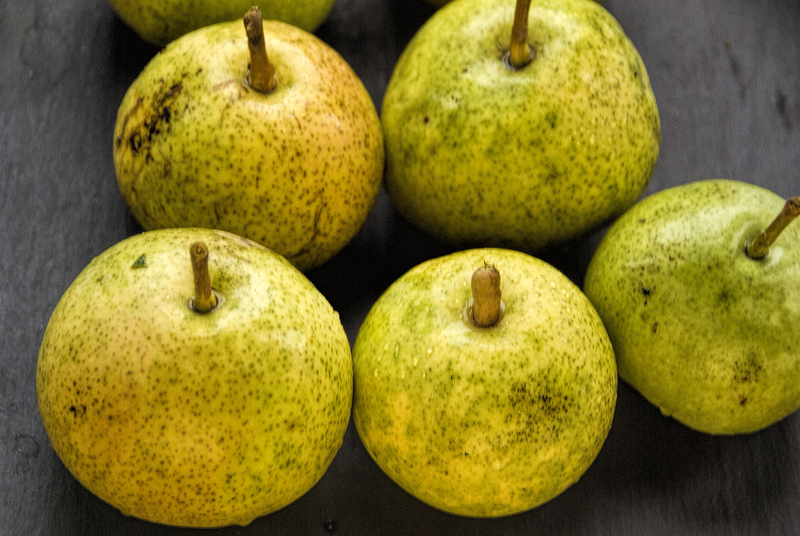 I think this variety, shown in the photograph above, is called Shipova, but if you’re someone who knows their pears do please let me know if you believe I’ve got that wrong. I have been experimenting a great deal of late with my recently acquired sous vide water bath. It can transform the way some foods can be cooked and presented, and I’m likely to post a few more sous vide recipes in the future as I continue to get the hang of it. In the case of pears, the flavour of the fruit is beautifully intensified through this cooking method, which requires the food to be vacuum sealed and then cooked at a steady temperature. This way, it retains all of its goodness and sweetness, with no need to add sugar. I learned a few years back (on a cookery course at Raymond Blanc’s le manoir aux quat’ saisons, no less) that the key to a good crumble is to cook the fruit and the crumble separately – otherwise you can end up with overcooked fruit, soggy crumble or, even worse, both. 1. Pre heat the sous vide water bath to 83 c. Pre heat the oven to 150°C (300°F, gas mark 2). 2. Peel and core the pears and cut them into quarters. Place them in a sous vide pouch. Remove the air from the pouch and seal. Place in the pre-heated water bath for one hour. 3. While the pears are cooking, make the crumble. Pulse the hazelnuts in a blender until they have the consistency of course flour. Combine the flour, butter, sugar and cinnamon and mix together until you have a texture resembling breadcrumbs. Add the ground hazelnuts and mix again. 4. Spread the hazelnut crumble mixture evenly and thinly across a shallow baking tray and place in the pre-heated oven for 8-10 minutes or until golden brown. Check regularly to make sure the crumble does not burn. Remove from the oven, stir and allow to cool. 5. To serve, remove the pears from their pouch. Place six pear quarters in each dish. Sprinkle with two tablespoons of the crumble. Serve with a quenelle of ice cream or creme fraiche. Is the sous vide machine worth the outlay Steve? Good question! It’s still a novelty for me at present so I’m using it a lot and, right now, would say yes without hesitation. Not everything I’ve tried has worked but, overall, it has been great for enhancing textures and intensifying flavours. It makes amazing poached eggs (poached in the shell!) and is brilliant for things like custard and ice cream – guaranteed perfection with a minimum of effort. Also extraordinary, I’ve found, is halloumi (cooked sous vide with a tablespoon of buttermilk, it comes out beautifully light and creamy). Vegetables like carrots and celeriac work well (potato less so) and in this recipe it produces beautifully textured, sweet pears without the need for a sweet cooking syrup as would normally be the case. So, in summary, it’s a thumbs up from me! I’ll wait for the meaty reviews before committing!! Loving the blog by the way! Hopefully see you guys over New Year sometime. That’ll be a long wait on this blog! Thanks for the kind comments . Look forward to seeing you and Zoe soon.